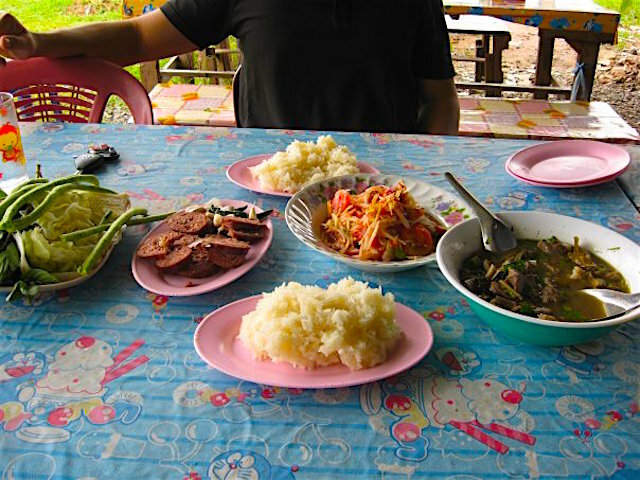 Some of my favourite eating experiences in Thailand have been upcountry, hours from the Bangkok, in modest establishments roadside, beachside, and riverside. Isan, which you'll also see spelled Isaan, Issan, and Esarn, is the very dry, very poor, northeastern region of Thailand. It gets very few international visitors. It's also one of my favourite parts of the country. In 2008, my friend Daeng and I did a 2-week road trip around Isan in his Toyota Hilux, stopping off in Ban Chiang, which has a prehistoric UNESCO World Heritage Site, to visit his family. We also hit Khorat (also called Nakhon Ratchasima), Khon Kaen, Udon Thani, Loei, Chiang Karn, Dan Sai, and Phetchabun. Lunch was never a problem. You can always find a roadside eatery that dishes out local favourites. Pictured below is our noon meal at one such roadside operation. It was basically a tent, and the owner did her cooking over a portable gas burner. Your beverage choices are usually limited to water or iced tea, by which I mean heavily diluted cold green tea, though some outfits may sell soft drinks. 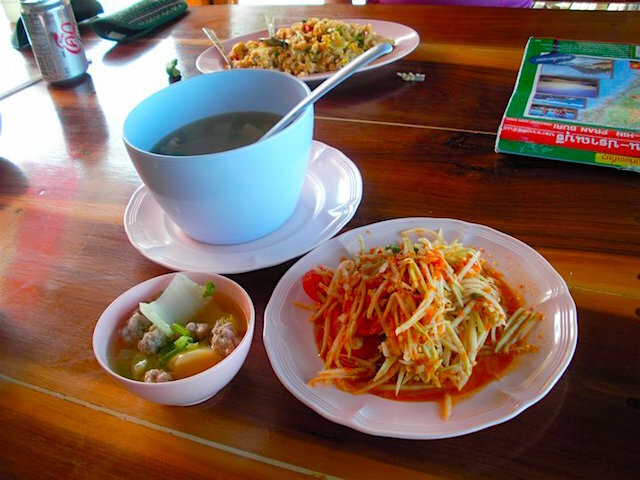 From left to right, the dishes shown above are Isan-style sausage, fiery papaya salad (i.e. somtam), and tripe stew, all served with sticky rice and raw greens. I can't remember what this meal cost, but I assure you it was no more than a few dollars. Nothing is easier than going to the beach in Thailand. Other than some cash, you don't really need to take anything, at least not if you're going to a popular beach. Why? Because keen entrepreneurs are there to sell or rent you anything you might need, from a swimsuit and towels to food and drink. In most cases, the sand is populated by rows of folding chairs and tables under brightly coloured umbrellas. The procedure is that you rent chairs for your party, and the concession operators can supply you with everything you need. If they don't happen to have it, they'll outsource. I've literally set off for the seaside in my city clothes and totally outfitted myself on arrival. Of course, you don't have to make a day of it. My favourite way to have lunch on road trips down coastal highways -- and Thailand has A LOT of coastline -- is to stop at a beach. One of my faves is Ao Manao, or Lime Cove, south of Pranburi, which is itself south of Hua Hin on the Gulf of Thailand. We're talking about 4.5 hours' drive from Bangkok. The pictures below were taken on a road trip to Nakhon Si Thammarat, and this was more or less the half way point. The beach at Ao Manao is located inside a military base, so you have to go through a checkpoint when you turn off the highway. 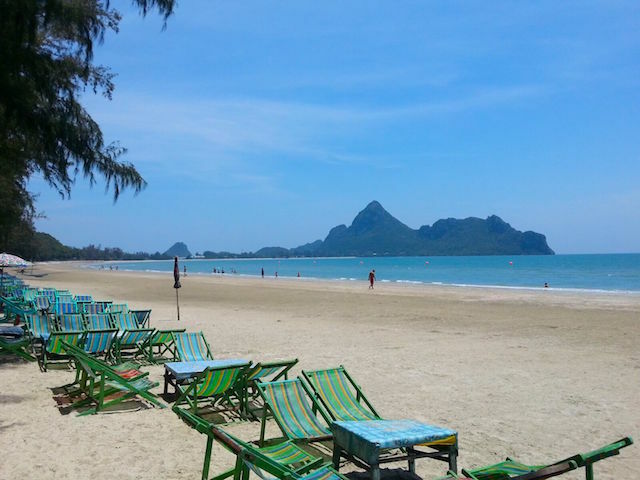 My friend left his Thai national ID card there, and we then drove down to the beach area and selected a chair operation. The vendor appeared with a bucket of ice, water bottles, and a menu. We made our selections and he went away. 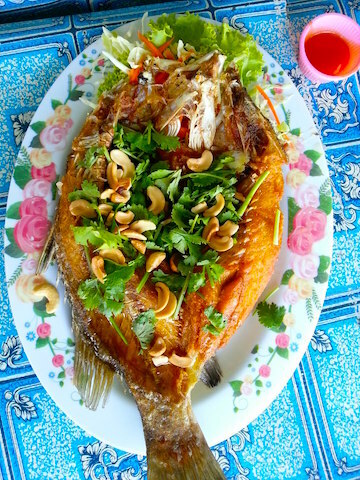 About 20 minutes later, a motorcycle sputtered up and delivered our lunch: a grilled fish in lime and garlic dressing, an omelette, and a minced pork and vegetable soup. We ate, had a short nap in our chairs, used the nearby loo, and then carried on southwards. This drill was repeated at every lunch stop through the whole trip. Friends of mine bought a condo at Dolphin Bay south of Pranburi, which is near Khao Sam Roi Yot National Park. When I visited them, we decided to bike over to the park, a ride of about 7km. Our aim was to see the famous royal pavilion in one of the park's caves. It had been built for a visit by Rama V (r.1868-1910). Before riding home again, we decided to have lunch in one of the eateries on the edge of the park, overlooking the Gulf of Thailand. The tables were in simple wooden pavilions. The owner had a mortar and pestle sitting in plain view, so we promptly decided to order papaya salad, AKA somtam, supplemented by a minced pork and vegetable soup and chicken fried rice. I seem to remember that we ordered a second plate of fried rice, too. Frankly, there wasn't much else on the menu. The good thing about a short menu, of course, is that the few items that are offered are usually done really well -- and they were. When visiting an unfamiliar Thai city or town, there's a surefire way to find a good restaurant -- provided that a river runs through the place. If there's a river, you can be 90% sure that there will be at least one floating restaurant moored to one of the banks. A good place to look is under a bridge. Returning to Bangkok from Hua Hin one time, my friend and I turned off the main highway in Nakhon Chaisi, a town between Nakhon Pathom and the capital. We left the vehicle in the parking lot of the municipal office, which was in view of the main street bridge. Sure enough, there was a restaurant barge tethered to the bank of the river. It was full of what appeared to be local office workers, many of them probably from the municipal office. After ordering, we watched lotuses and other riverine vegetation float by on the rather strong current. The dishes arrived all at once: yum talay (seafood salad), a yellow curry with some kind of river fish, fried rice, and a mixed vegetable dish, pictured below from left to right. The soup, in the metal tureen at right, arrived slightly later. It was probably the best meal of that particular trip. 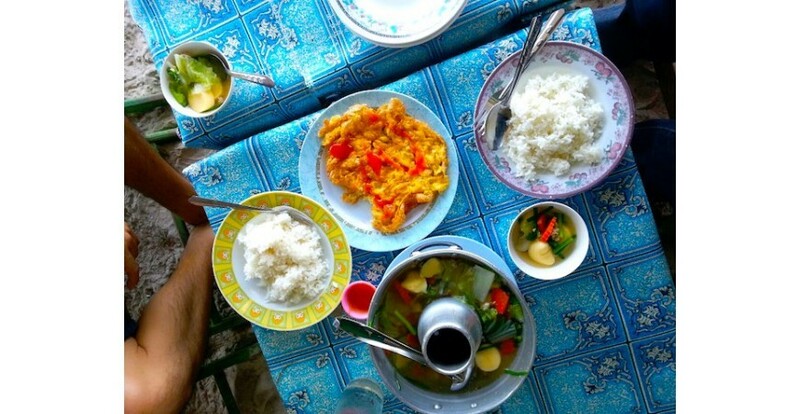 I fondly remember similar relaxing, riverside meals in various provinces, including Lampang, Nong Khai, Kanchanaburi, Chanthaburi, Chiang Mai, Uthai Thani, and Ayutthaya. Of course, you don't have to leave the capital to eat on water. The banks of the Chao Phraya River in Bangkok feature numerous eateries, to say nothing of the many lunch and dinner cruises that are available. 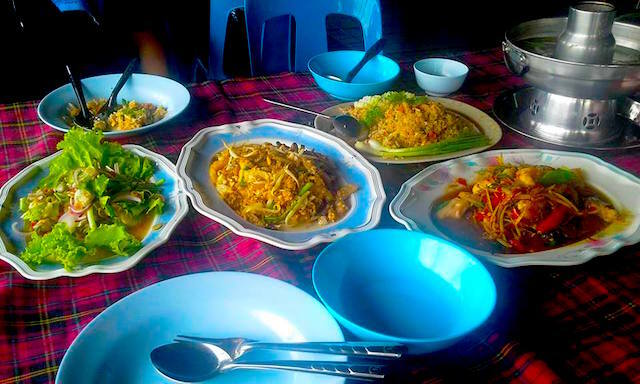 This article concludes the 'Eating in Thailand' series, which now consists of 3 posts: 'Eating in Chiang Mai,' 'Eating in Bangkok,' and 'Eating in Upcountry Thailand.' If you haven't yet read the other ones, you can find links to them at the bottom of this page. Things to eat and drink in Bali, Indonesia's "paradise island." What to eat and drink in Taipei? Read on to find out!